A CAT6 cable from the airport to another airport in "Building B"
A CAT6 cable from airport to a ubiquiti Nano AC. This Nano AC then beams the connection over to another Nano AC located in "Building C." A CAT6 cable connects this Nano AC to yet another basestation. Will this work? Any setting changes I should be aware of? Advice? Hey @ryan-cochran, I don't see anything wrong with your configuration and AmpliFi should work great for you in this scenario. My recommendation for you would be to configure all routers and mesh points in Building A as wireless mesh points first. Then in the application settings, enable ethernet backbone for the two remote locations. Once they tell you to "Plug in cable" they are ready to be relocated. Hi @ryan-cochran - for Building C you are showing some additional wireless mesh points. Consider starting with just 3 standalone HD Routers (don't buy a kit system) and doing a site check on Building C first to determine how much additional coverage you need. 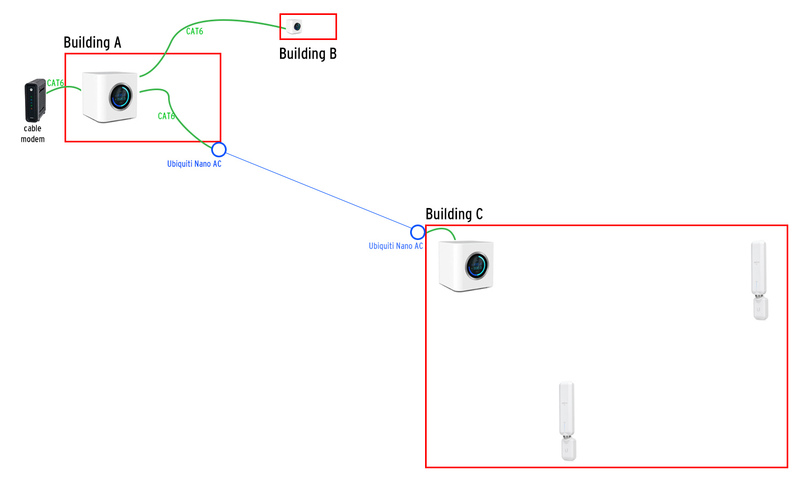 If you can, run CAT 6 in Bldg C to the location(s) where you plan to install any additional mesh points as Ethernet backhaul daisy chained to the Bldg C router works very well. But you would then need to use either HD Routers or AmpliFi Instant Routers as the additional mesh points. Note that AmpliFi Instant Routers are only 2x2 MIMO and have a lower maximum throughput spec and range, but I personally would still choose a wired Instant over a wireless MeshPoint HD. In either case (wired or wireless) for Bldg C you might find you only need one additional mesh point for full Bldg C coverage.